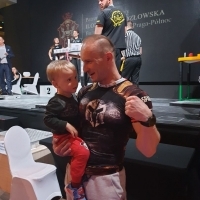 The Polish Open Professional League tournament in Armwrestling - Club Concordia Skarszewy 2019 is an event where all participants of the URPA rating can compete. Also during this tournament there will be rating armfights between the athletes representing the Elite division. Men: 63 kg, 70 kg, 78 kg, 86 kg, 95 kg, 105 kg, +105 kg, right and left hand. Females: 57, 65 kg, +65 kg, right and left hand. Each athlete who will take part in the tournament will be registered in the URPA rating. The rating armfights will be held by: Piotr Bartosiewicz (Poland) vs.
David Bartosiewicz (Poland) vs. Mantas Asmonas (Lithuania), 6-round fight, right hand.